I am standing in the dark, not the gentle grey of dusk or the soft black of a moonlit night but pitch black. My heart batters my ribs like a bird beating its wings against a glass cage. I wave my hand in front of my face. I can't see it. I never knew it could be so dark. My edges are merging with the inky blackness around me. My dad would finally be proud of me. I've blended in. The book is told in first person from Neva's point of view. It is also told in present tense, adding to the drama and intensity of the situation. The Protectosphere reminded me of the Jim Carrey film, The Truman Show, although their lives were not being filmed and broadcast out to thousands. Neva is caught in a love triangle between her best friend Sanna and Sanna's new boyfriend Braydon. The scenes where Braydon and Neva are together are beautiful , yet intense and they made me believe in the future of their forbidden relationship. I am pretty sure Sanna realised how they felt about each other, which seemed to make her more clingy to Braydon. I found I wanted to shout at her to give him up and have some dignity. You can tell what kind of girl I was when it came to boyfriends. I liked Neva and found her quite sassy and defiant. She was definitely going to get to the bottom of what was going on in her world. I got annoyed with Ethan - seriously annoyed! I found him to be a little leech like and I want to see him suffer in future, as I have no sympathy for him at all. I loved the symbolism of the snowflake. As everyone within the Protectosphere began to look alike, the snowflake stood for individuality and showed how everyone was different. From the first chapter you realise you are in a rather claustrophobic dystopian world. Life appears normal on the surface, but you soon realise that society isn't progressing well under the Protectosphere. I struggled with the darkness in the first chapter as it felt so powerful and close and I quickly realised that I don't cope well in small confined dark places! I am quite glad their were no more dark parties, but then I struggled with the relevance of the title Dark Parties to the rest of the book. Then is clicked, perhaps the author was referring to the all the parties involved being in the dark about what is really going on under the Protectosphere! The ending of this book was explosive. I was shocked by the wrong turns the story took. I was desperate for Neva to reach her destiny, but so many people seemed intent to stop her. I can't say a lot more without giving the plot away. It was like being hit by an earthquake as you experience one aftershock after another. Very powerful. From the way it ended, I would put money on their being a sequel. On the whole, a very good dystopian novel, that reminded me a little of Pretties by Scott Westerfield and Delirium by Lauren Oliver, yet a completely different plot to either. Does that make sense? If you love dystopian, you will really enjoy this book. 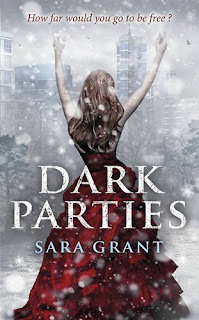 Dark Parties sounds like something I might not have read the like of. I like to be a bit shocked as opposed to turns one can smell coming from a mile away. sounds like a great read, I especially like your description of the ending. Mari - it takes a lot to pull the wool over my eyes, so I was very surprised by the turn of events. Susan - do you read a lot of dystopian, hun? You have to love dystopian to enjoy this one. Petty - Thank you. I did enjoy it. I love the cover of this one - not sure if it's the book for me, though. I'm not the biggest fan of dystopian fiction. I need to be in the right kind of mood to enjoy them. I've not actually read any distopian so I'm not sure I'd like it, although it's one of those books that I'd be likely to buy because the covers so pretty! This sounds like just the kind of dystopia I like. Leanna _ I love dystopian fiction. I could eat it for breakfast. Louise- you have to try dystopian fiction! May I suggest The Hunger Games to begin with - ease you in gently. Kathy - you bet. I hope you get to read it. The way you describe it as claustrophobic reminds me of how I felt with Forest of Hands and Teeth. Loved that book. Jessica - I am reluctant to reveal the release date now as I have just hear it has changed. You will love it when it comes out. Carmen- I hate that claustraphobic feeling! I love Dystopian and have had my eye on this book since I first heard about it. It sounds amazing so I really cant wait to get my hands on a copy! :D Great review!